In 1990 I led a medical team in a remote Bolivian village near the border with Argentina. A child was brought to us who was dying of malnutrition and dehydration. The medical team did all that they could, but they knew they were too late to save this child. One of the most difficult things for me to explain is why I do the work I do. Even most Christians don’t get it. While I want to help people, that isn’t the main reason I’ve given my life to helping the poorest of the poor in Bolivia. I strive every day to facilitate the cleaning up rivers, build bridges, do erosion control, or irrigation; and to bring safe, clean, clear water to Bolivia is because: ‘I tell you the truth, whatever you did for one of the least of these brothers of mine, you did for ——- ME.’ I’ve come to believe that that scripture is literally, true; not figuratively. Look! Look really closely. Look past the disguise of being a woman, a child. Look past the disguise of appearing to be a man or a woman; a boy or a girl. Look past the color of their skin. Look with the eyes of Faith and you will see what I see: It is Jesus! It is Jesus who is dying from the lack of good safe water. It is Jesus who is hungry and thirsty. 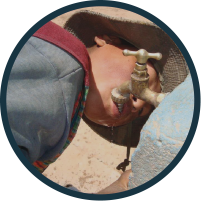 When we bring water to a Bolivian village, parched from contaminated water which vanishes during the dry season, we are LITERALLY giving water to Jesus, He so identities with the poor and needy, HE dies on the Cross of Thirst every time a child dies from waterborne disease. You and I have the incredible opportunity to relieve some of the pain and suffering of Christ Himself. Think back to a time when you were in Bolivia, or whenever you were with the poor in the U.S. or elsewhere. Where did you see CHRIST suffering? Where did you see HIS pain? And here is the cool thought for the day: “Where did YOU relieve HIS suffering? Because – – – you did! You are doing it right now! 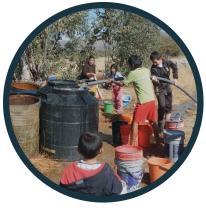 As you fast, as you collect donations for water projects in Bolivia, YOU are relieving HIS suffering. Listen to Christ’s words of ‘Thanks’ to you.